The scene on Sunday was one of people and boats emerging from deep winter hibernation. They were greeted by a light mist ready for the the first of the Mirror Northern Travellers. Nine sets of red sails, including one visitor, made their way down to the waters edge with some keen and excited helms and crews. The plan was to join in with the club's slow handicap fleet two minutes after the fast fleet started. With the fleet chomping at the bit, however, they took off early on the one minute gun causing some confusion! The forecast of a light NE breeze, around 5-7 knots appeared true. With the breeze off the land there were definite patchy areas. With some lifts nearer the shore Wild Thing (David & Olivia) reached the first mark ahead of Graham and Sebastian Vials, closely followed by juniors Ed Coady and Abi Cowley who were sailing the Mirror Class Association demo boat. With a range of age of boats (some leaking), rigs and experience the fleet spread out across the course. By the second Gybe mark Graham and Sebastian sailed over the top of David and Olivia and then took off to open a huge lead. Wild Thing dropped back into the clutches of Ed and Abi in MCA and Fiona and George sailing their new boat Missee Lee. Ed managed to get past his Dad and sister on the last run, only to fail covering them on the last beat, hence letting Wild Thing back through into 2nd place. With start timings adhered to the second race was sailed straight away. A heavily port biased line allowed Graham and Sebastian to make a great start, tacking straight onto port. Wild thing continued left then gained on some velocity lifts. As the fast handicap fleet descended through the leaders it was hard to keep boats moving in the light breeze. Graham made it into the top mark first and held to the finish. David and Olivia in Wild Thing followed on in second, Ed and Abi got past before the finish and this time were more clinical in the last short beat to take 2nd with Wild Thing a close third and Missee Lee again fourth. Some great racing was taking place further back in the fleet amongst. 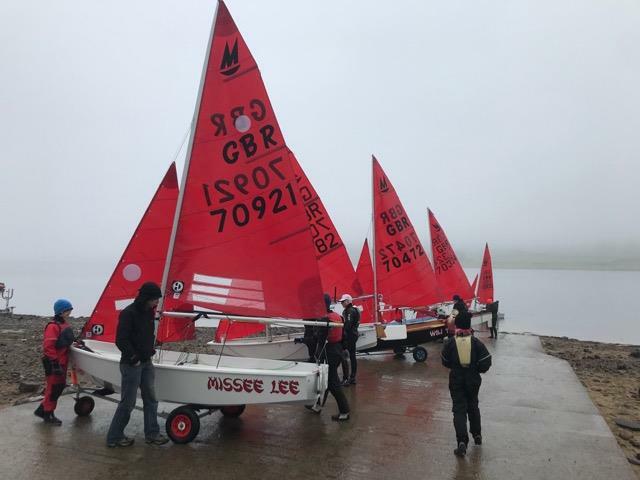 First time Mirror Sailors and juniors Rebecca Green and Grace Gordon sailed well. Matt Rhodes sailed his first race. There was a new pairing of Patrick and Mary Jane battling the parent and child boats of Martin and Alana Startkie and Dave and Lola Saunders. After the first two races the fleet headed in for lunch. Having two firsts Graham decided to use the afternoon to take out his twin daughters for a short sail and miss the third race, while older brother Sebastian warmed up. Race three what hotly contested between MCA boat and Wild Thing, with Father getting the better of son by the three inches on the line. As the club race officer was planning a fourth race some headed in for an early shower, as only three were planned for the open meeting. Children and parents swapped places and boats to enjoy the calm conditions for a final fun race. Prizes consisted of Easter eggs and the fantastic 'Mirror' Trophy which was presented to Graham and Sebastian -worthy winners.